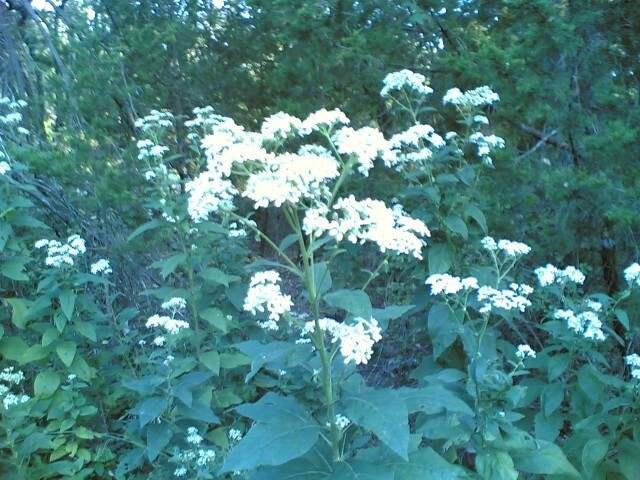 This entry was posted in Web links on September 30, 2007 by Links. Today, we had a new guy, Dan, join us who I know from work. He did pretty good for a beginner. His side arm throw is better than mine. And he actually sank a long putt on hole seven. Afterwards, we ate at Mangia Pizza because they have an outdoor seating area which allows dogs. John grabbed Loco! out of his car. 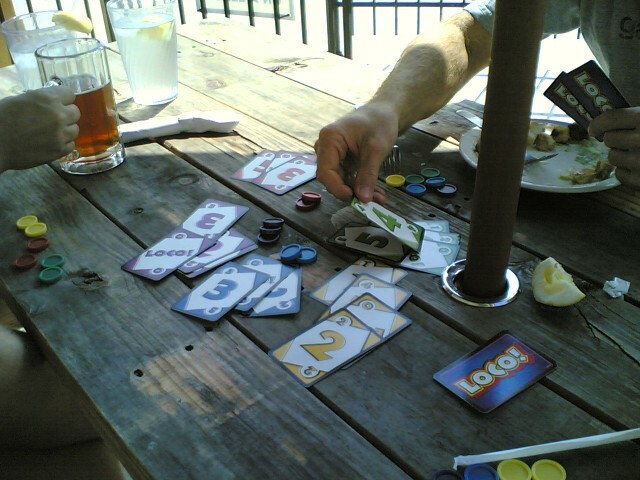 Too bad it was a little too breezy for this card game. 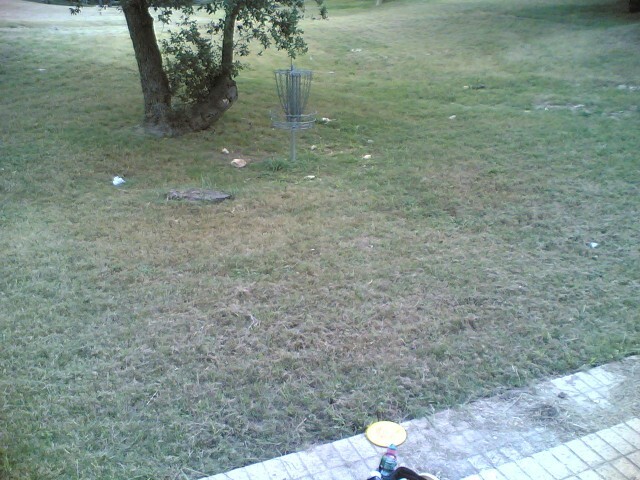 This entry was posted in Disc Golf on September 29, 2007 by Mark. Gravitt was abnormally missing today at Wilco. Which may explain why I was throwing good today. Hole number 3 has a tough first throw. And I made it into the green around the corner. 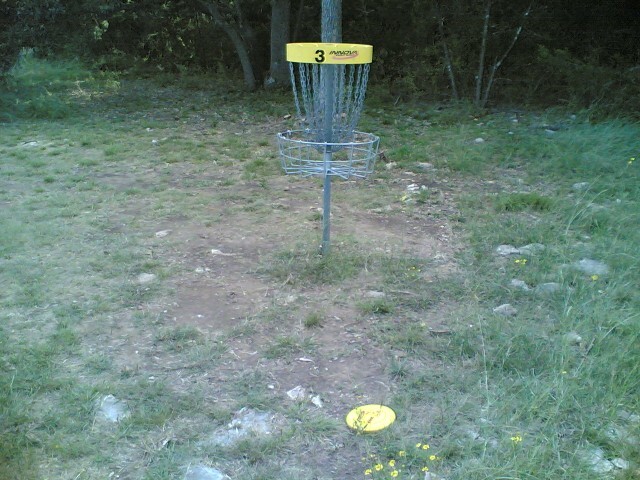 My third throw landed next to the basket making this an easy par. Holes 5 and 8 were easy birdies as well. 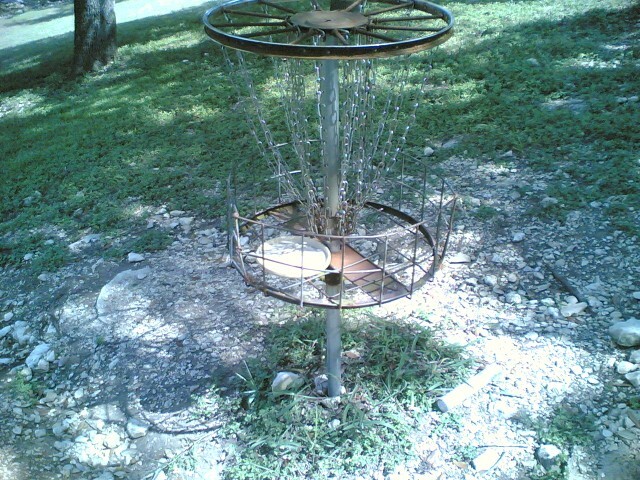 This entry was posted in Disc Golf on September 28, 2007 by Mark. Supposedly, this map is balanced for three players. But I think we played the game wrong. Doug and I were competing while Jon was left alone. Another clue was that we never used any of the supplementary track tiles which came with the game. So I think the goal was to get as convoluted as possible. And we didn’t deliver as much black goods (giving negative points) either… Perhaps another replay is in order. This entry was posted in Gaming on September 27, 2007 by Mark. The cafeteria is a rip-off. 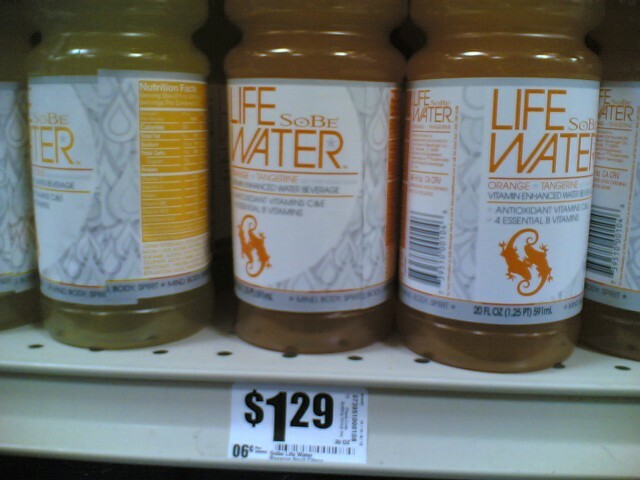 They charge $2.12 for a bottle of Sobe Life Water. H.E.B. is a little better at $1.29. But Sam’s Club has them all beat at $0.845. Don’t you think that a dollar markup over the grocery store’s already marked up price to be a little high? This entry was posted in Interesting on September 23, 2007 by Mark. The start for today was rather brutal for John. 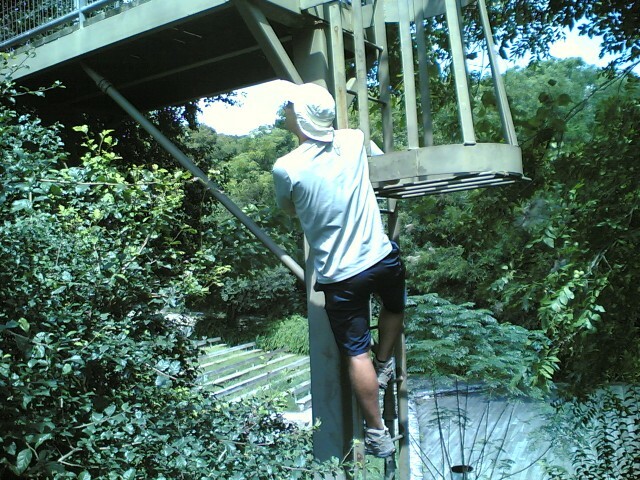 He whacked his hand on a metal pole and caused the disc to fly off course. Where we lost it in the trees. And that was not the only disc that we lost. I lost two. And John lost three. But we came back after the first round was over and were able to spot the disc high in the trees! The tournament took forever. 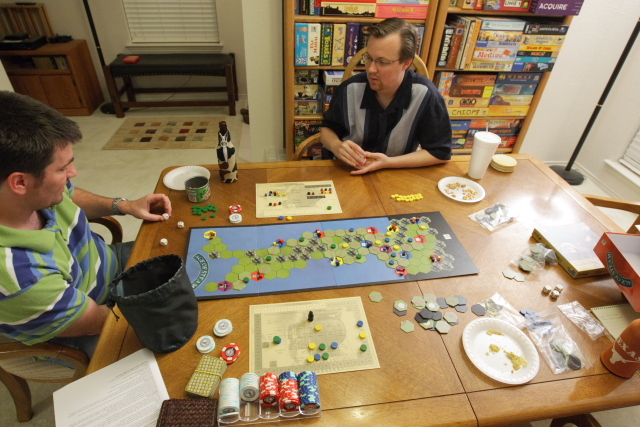 The biggest problem was that it was played over two courses that were miles apart. We were forced to wait for everyone to comeback from Kyle. Finally, at 3:30 we headed out for the second round. I kept remarking how it had not rained yet. 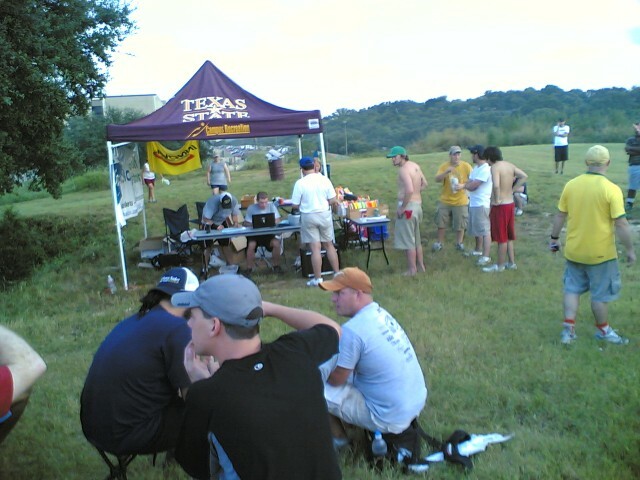 And the fact that this was the first tournament that I have ever played where it has not rained. But fate would continue along in its footsteps and sprinkle a little bit on us. We were lucky. It rained much harder in San Marcos where we had just left. 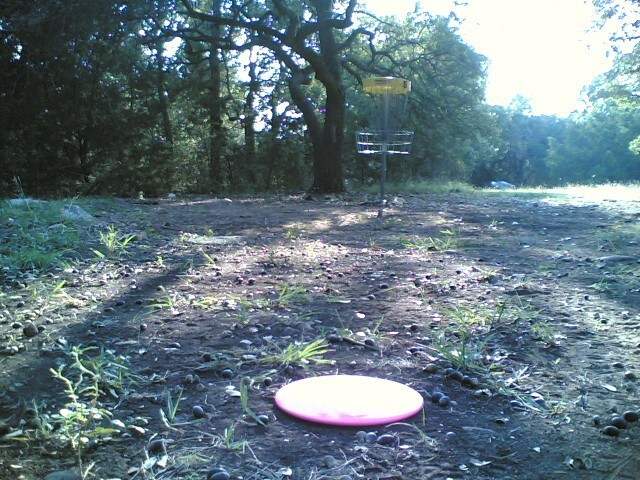 This entry was posted in Disc Golf on September 15, 2007 by Mark. 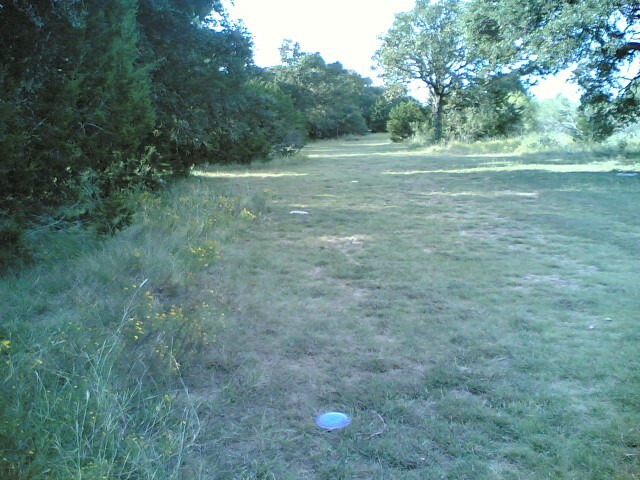 John and I drove down to San Marcos to check out one of the two courses where the Bobcat Open was being held. There was a map, but it was for an old layout. John and I kind of wandered around and made some holes up. 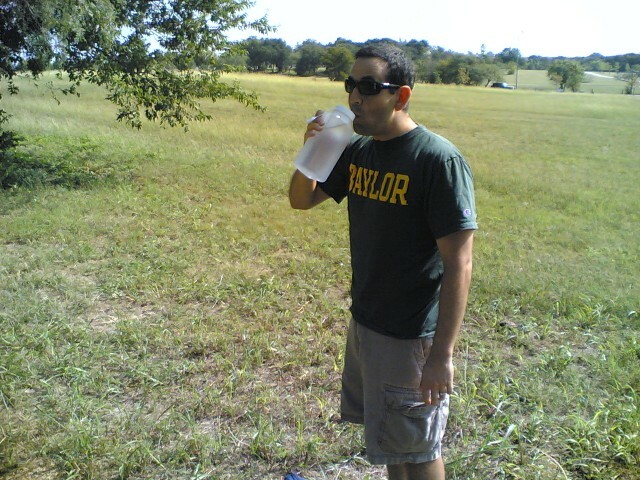 But we eventually found some disc golfers and followed them to figure out the course. Hole 9 was interesting. It was a short hole on top of a small hill where you had to throw over cars parked for some construction work towards the basket. You cannot overthrow it because some buildings line the surrounding area. I landed close enough for a birdie. Most of the baskets were older models that were not too visible. However, one seemed rather home made but functional. 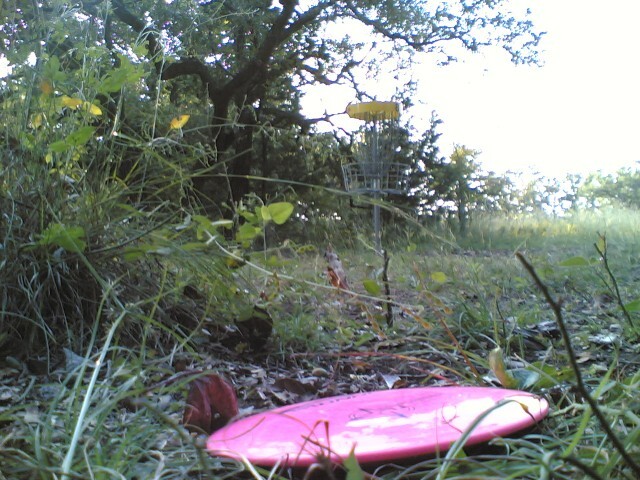 This entry was posted in Disc Golf on September 14, 2007 by Mark. 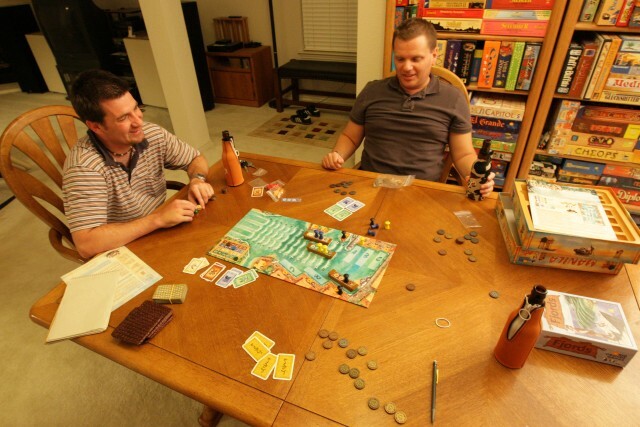 The mourning for Franz-Benno Delonge continued tonight with this two player game. I like it. It is a combination of Carcassonne and Go. Probably not so much like Go. 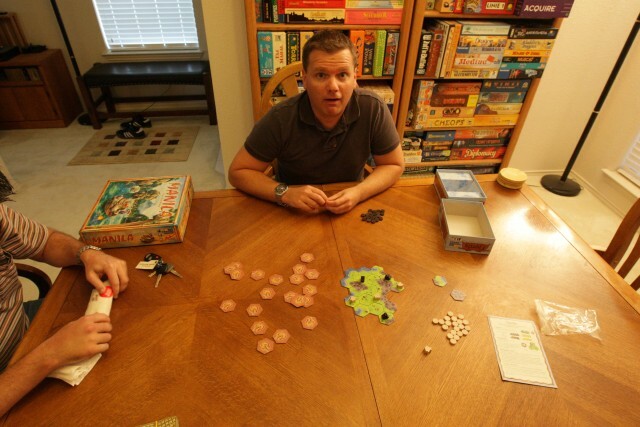 But after the board has been created, you do need to carefully consider how to expand your territory such that you get more than your opponent. Mike didn’t have a chance. Next up was a betting game some what like craps. Well, like craps in the sense that you are placing pieces that are bets of probabilities. For example, the bet that all three ships make it into port is less likely than the bet that at least one will make it. So the payouts are higher for the riskier bets. And how can you not like the pirate bet where if the ship lands on the 13th spot, then you get a big reward. Which Jon took advantage of twice (and pretty much gave him the game). 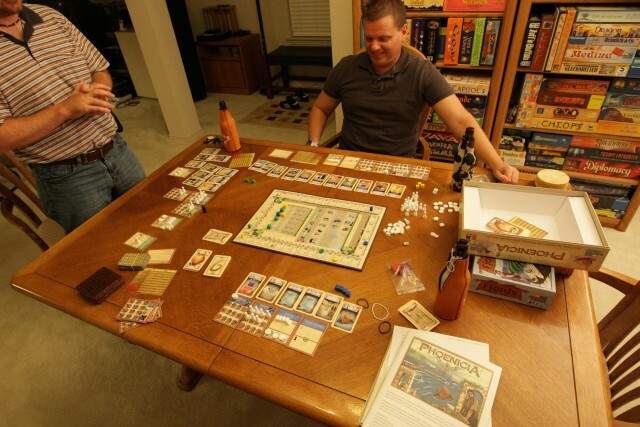 Next up was another three player game of Phoenicia. I tried to go after cloth-making. And once again I hurt myself on a fort purchase during the first turn. Another thing that hurt me was the poor distribution of cards. Besides my first 6, I kept drawing 4s and 5s for money. And the cloth house came out late. When it did, I did not expect Chapel to overbid on it. It was completely useless to him as he went for advanced mining. That move decided the game right then and there. I was in last place and Jon was in first. Jon was clearly making more money than Mike. But Mike wanted to play it out to the end. Not that it made a difference. This entry was posted in Gaming on September 13, 2007 by Mark. The sushi group went to Maru. A new sushi restaurant near Central Market. It was not bad. The decor was lacking. But the food was decent. Sadly, it is a little too far for lunch and Ichiban is still number one for lunch-time sushi. This entry was posted in Interesting on September 13, 2007 by Mark. A couple of the 42 players talk about finessing. And I wonder just how often you are able to finesse in 42. After all, there are only seven tricks in the round. And the “cards” in your hand are members of two suits. Usually, the focus in this game is to take the point bones (3:2, 4:1, 5:0, 5:5, and 6:4). However, there are times where you are “booked” and points do not matter. You must take all of the remaining tricks. It seems to me that the finesse in 42 is an all or nothing proposition. Definitely when you are “booked.” But also when the opposing team is looking for opportunities to dump points onto a loosing trick. You do not normally want to loose control of what is led since you often have losers that you might be forced to play. Whereas, it might not be that case in bridge. With so many more cards, I think all might not be lost if your finesse fails. You can try some other strategy. Or am I wrong? This entry was posted in 42 on September 10, 2007 by Mark.